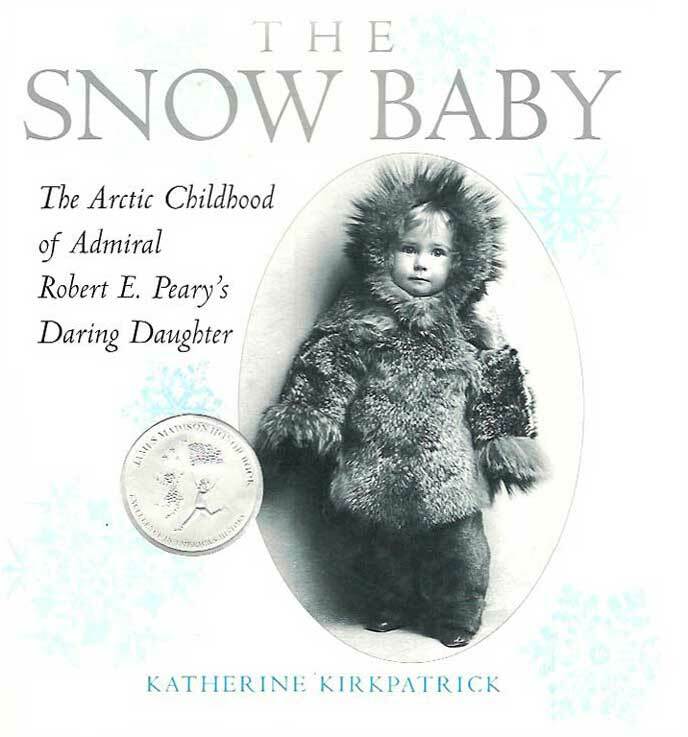 The Snow Baby published by Holiday House, 2007, was a James Madison Award Honor Book and a Booklist Top Ten Biography for Youth. A photo of a spunky four-year-old Marie Peary, posed near a gigantic meteorite on a ship, inspired me to write a book called The Snow Baby. 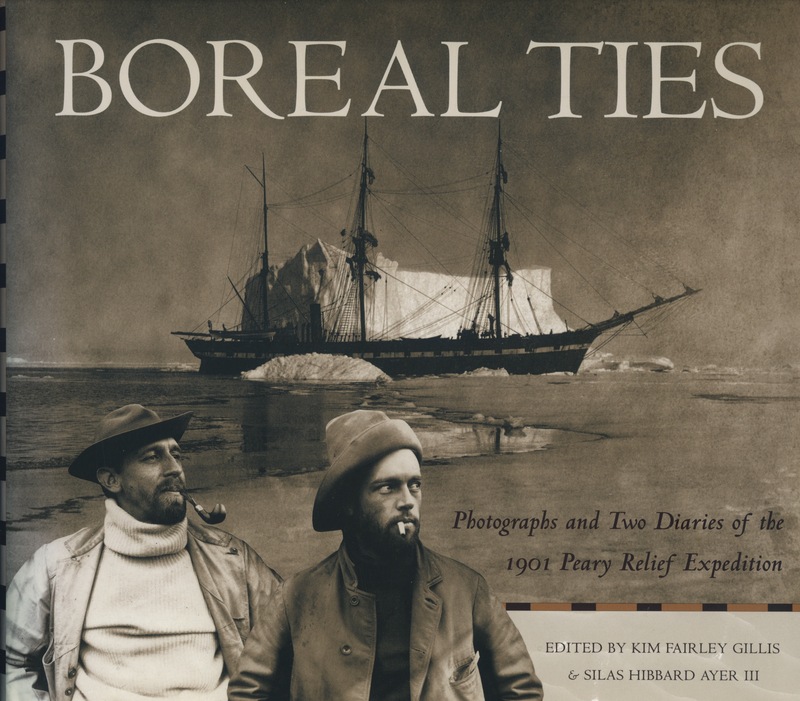 A photo biography, it tells of Marie’s childhood, from her 1893 birth in the Arctic to the age of sixteen, when her father, Admiral Robert E. Peary, reached the North Pole in 1909. 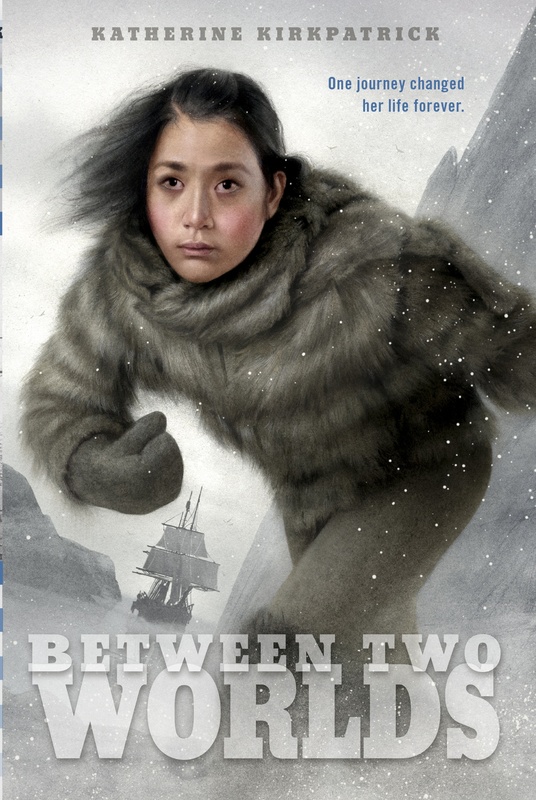 My forthcoming novel Between Two Worlds also includes Marie as a character. 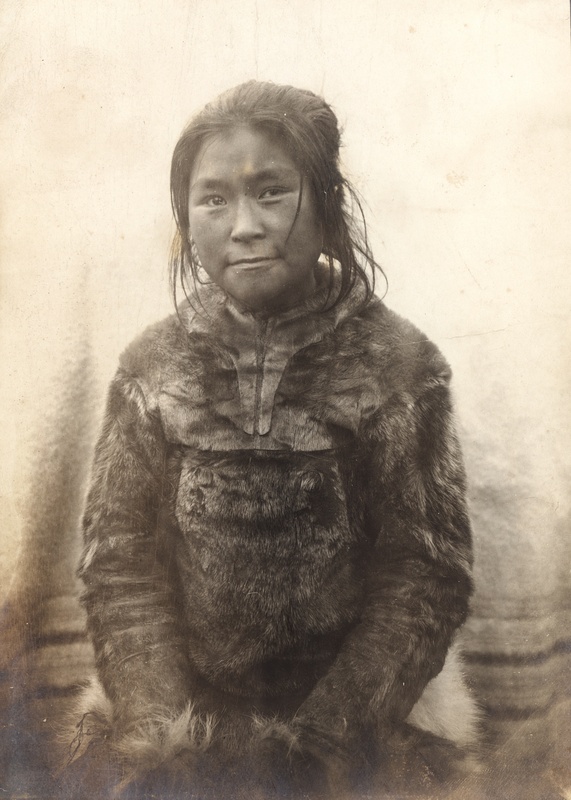 It was easy for me to fall in love with this child, who at the age of eight, dressed in seal furs on an ice-locked ship, played tricks on sailors and found ways to celebrate Christmas while the adults around her worried for their lives. In 2005, in the early stages of writing The Snow Baby, I met Marie’s son Commander Edward Stafford, who was at that time in his late eighties. 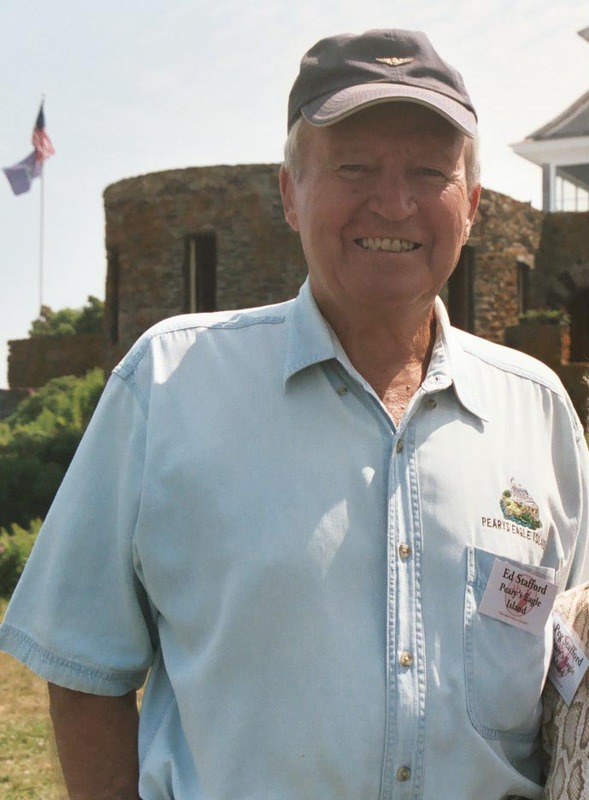 Though he lived in Florida, he periodically returned to Eagle Island near South Harpswell, Maine, to lead tours of the Peary family’s former summer home, now a state park. I was so eager to go on one of these tours, I took a plane trip of 3,000 miles from Seattle to New York with my four-year-old twins. 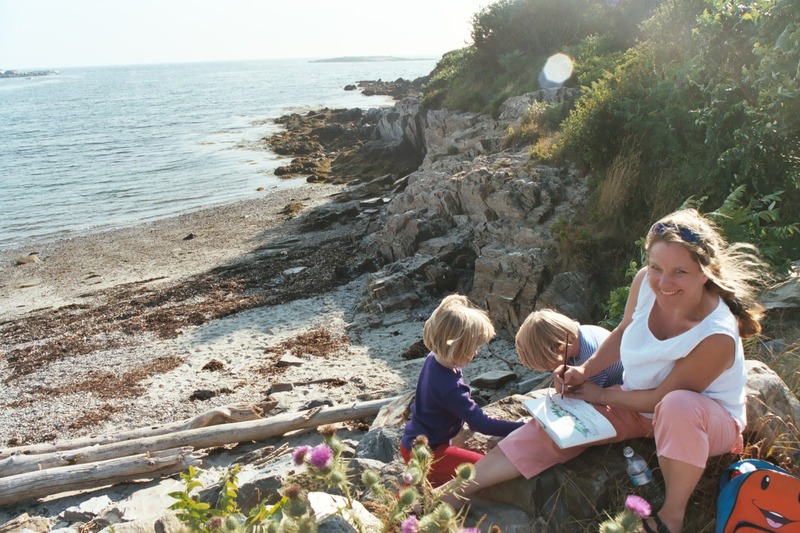 After meeting up with my dear friend, author/illustrator Sanna Stanley and her three-year-old son, we drove three hundred miles to Portland, Maine. A small outboard motorboat took us across Casco Bay, past many green, forested islands, to our destination. 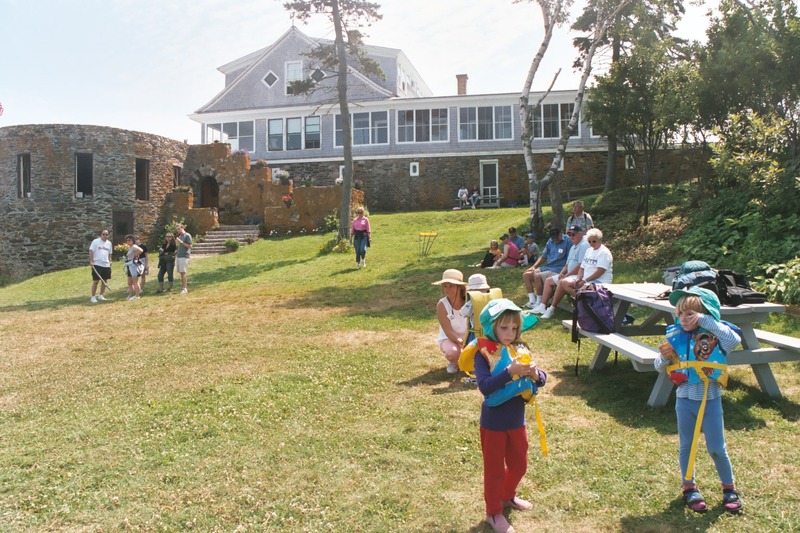 Set on Eagle Island’s rocky bluff, which to Admiral Peary looked like a ship, Peary placed his house where the pilot house of the ship would have been located. Considering his age and how my previous attempts of e-mailing him through a university museum had gone awry, I’d thought perhaps he suffered ill health. On the contrary, the man I met on Eagle Island, wearing long shorts, T-shirt, and baseball cap, vigorously marching up and down the narrow stairs of the old house, was astonishingly robust. He held his back straight. His face conveyed the certainty of a man sure of himself. Indeed he’d earned seven battle stars in World War II on anti-submarine duty on naval destroyers and destroyer escorts in the Caribbean and Mediterranean. Stafford remarked that though his illustrious grandfather died when he was nineteen months old, he knew the man through Peary’s wife and daughter who loved him. Through them, something of his grandfather’s force of character transferred itself to him. True, as far as I’m concerned. In my great enthusiasm to meet Stafford, I made a nuisance of myself, asking him one detailed question after another. Perhaps with a frown or inclination of his head, Stafford conveyed his irritation to his wife, who was on the tour with us. She asked me to please refrain from asking Stafford questions until the end. “He needs to save his voice,” she said diplomatically. Meanwhile, for the next hour, ten other tourists fired away their questions and he happily answered them. Then as we stood on the house’s sloping green lawn near the boat dock, he finally gave me ten minutes of his time. 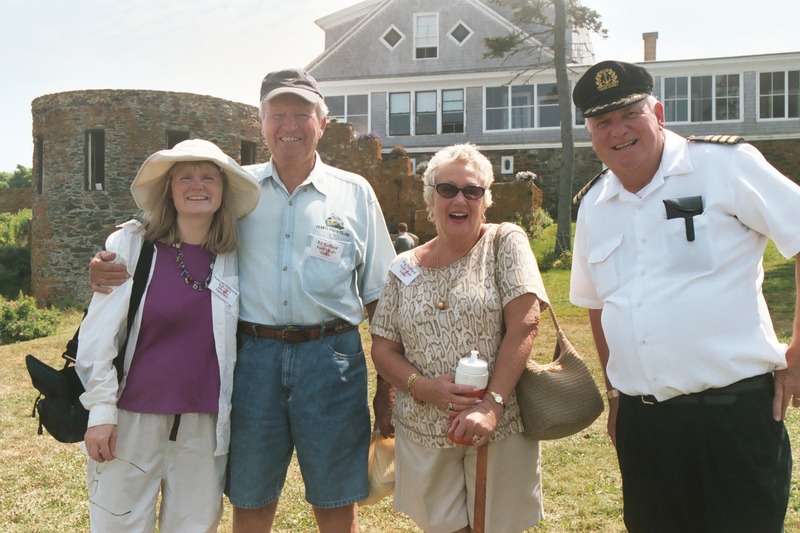 Katherine Kirkpatrick, Commander Edward Stafford, Peggy Stafford, and tour boat captain. Reflecting back, I realize it was naïve of me to assume Stafford would be happy to meet me just because I was writing a book about his mother. Celebrity families often keep to themselves for good reason. Stafford’s initial brisk attitude had everything to do with defending the honor of his often maligned grandfather. But setting aside any feelings of disappointment about Stafford’s reaction to me, I spent an absolutely wonderful day on Eagle Island. Stafford told stories with flair, as well as with knowledge and authority. He was the best of guides. He said the island was part of him, and obviously he took great pleasure in sharing it. I loved the house with its snug, shiplike, wood-paneled rooms, its panoramic views, its many tokens and reminders—such as Peary’s stuffed birds, mounted twenty-pound lobster, and Marie’s collection of tiny ivory figures—of the way an extraordinary family lived. My friend and I greatly enjoyed the island’s seventeen acres of fragrant woods, foxgloves everywhere in the underbrush, and rocky beaches. While I’d toured the house, she kept our active young children from the dangerous rocks and wild surf. Then the five of us explored the island together. 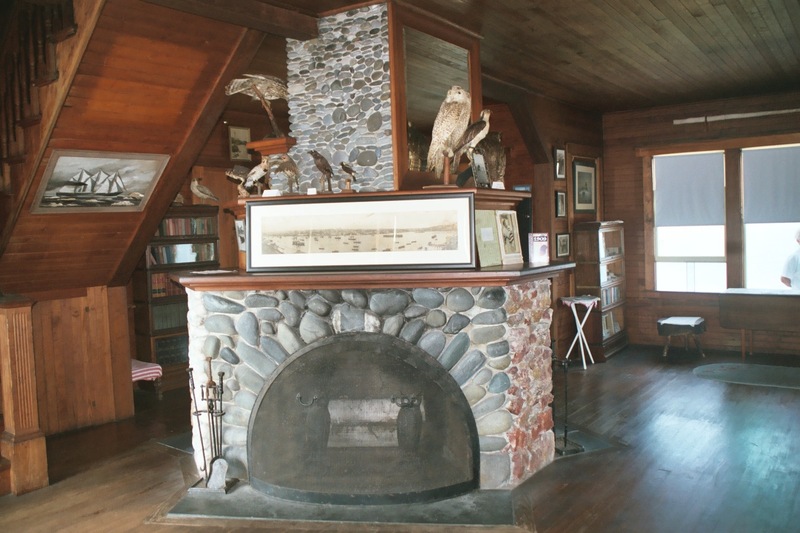 A three-sided stone fireplace separates the downstairs rooms in the Peary family’s home on Eagle Island. 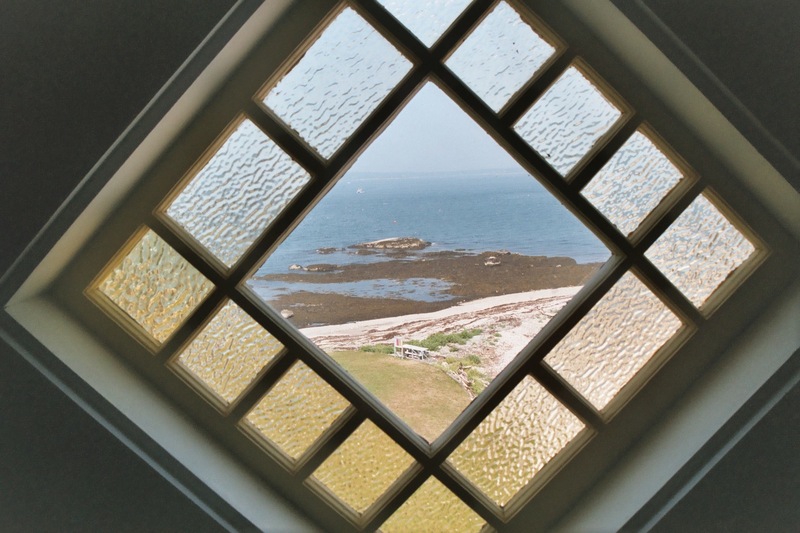 The view from an upstairs room in the Peary family house. 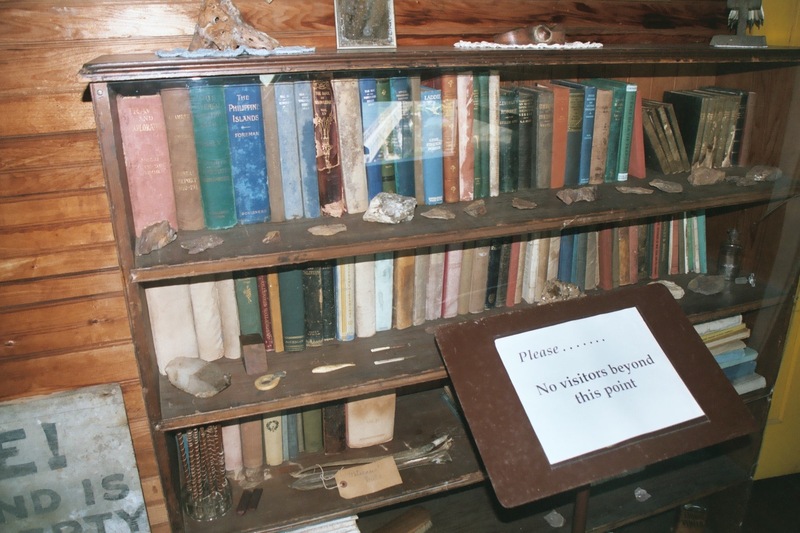 Marie Peary’s books and keepsakes. What’s more, just prior to leaving for an enchanted return boat ride in which dolphins leapt about our craft, Stafford gave me his business card. On the top right, printed in dark blue ink was the icon of a ship’s wheel with his name “Edward P. Stafford, Commander, U.S. Navy (Ret. )” and his address and phone number in Florida. With that splash of frigid polar water thrown on me, I set about a new draft, this time enlisting the expert help of members of a university museum. Within the next two years, I completed eight more drafts, two of which Stafford provided helpful feedback on. 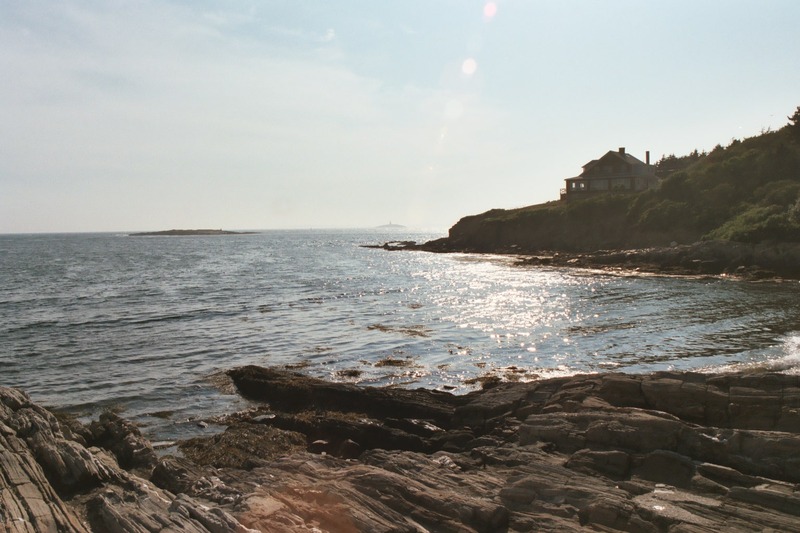 The Peary family house on Eagle Island, Maine.